Inventory We are a resale marketplace, not a box office or venue. Ticket prices may exceed face value. This site is not owned by Starlight Theater Kansas City . 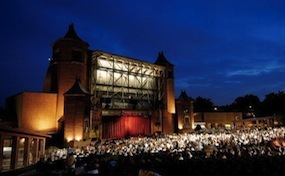 The Starlight Theatre originated in 1925 when Queen Marie of Romania was set to visit Kansas City. Some time later the theatre officially opened June 25, 1951 at a total construction cost of $1.5 million. The Starlight Theatre box office is located at 4600 Starlight Road in Kansas City, Missouri. The arena has a seating capacity of 7,947 and is used mainly for traveling Broadway shows, and concerts. Popular Starlight Theatre tickets have included shows like Les Miserables, Chicago, West Side Story, The Producers, and many more. Some of the performers that have graced the theater's stage include Jerry Lewis (who gave a big donation to make the venue more intimate), Tony Bennet, Kristen Chenoweth, Robert Goulet, Donny Osmond, Carol Burnett, and Phyllis Diller. Starlight.TheatreKansasCity.com is a privately owned and operated company that specializes in the sale of all tickets in the secondary market. We are not currently affiliated with any primary box office, supplier, or official website. Tickets may be priced below or above face value and can change rapidly with the market. To purchase tickets to any Starlight Theatre Kansas City events simply call our operators at anytime or choose the performance of interest and follow the steps online.